Shenzhen Cloumix Technology Co.,Ltd is one of the three largest e-cigarette sales companies in China. 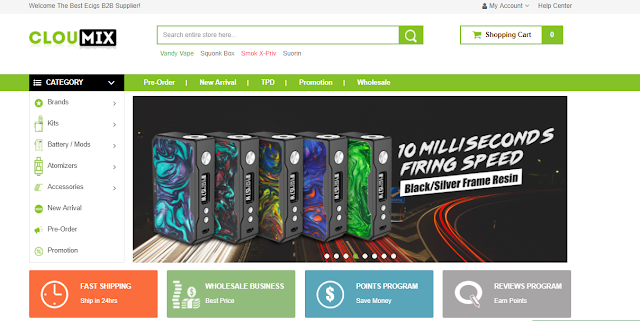 Cloumix vape online store with new skin is now launched again. Cloumix is an official authorized vape online store, so the products are genuine . Cloumix main sales product brands include: Aspire, SMOK, Joyetech, Eleaf, Wismec, KangerTech, Geekvape, Vandy Vape, Wotofo, Ijoy, Innokin, Sense, Vaporesso, UD, Justfog, Yocan etc. We promise 24-hour delivery and 7- Day money back guarantee makes your shopping safer and faster. Would You Like This Pen Style Vape Pen Plus Kit? Will IJOY Solo Plus 26650 Mod Be Your Buddy?